I am thrilled to be helping out with a friend’s engagement/bridal shower/party thing. It’s very low-key, and very small. Invites went out about a month ago, and last weekend I purchased all of the little favors / gifts for the guests. At that time, one of the invited guests asked if another person would be attending. I immediately confirmed that no, they would not. There was some concern since they recently had a bit of a falling out. The same invited guest was unsure whether she would be able to attend, so I wrote back to her again yesterday. Her response? I had e-mailed you asking if <not invited guest> was invited. If not, can you invite her? I would like her to come as well. Who does that? This is not an Evite gathering at a bar – it’s a very small sit-down meal. In what universe is it okay to ask that another person be invited to someone else’s bridal shower? And not five days out? Now, if the guest of honor had realized she left someone out, that’s one thing. But this isn’t the case. I was so put-off by this. It’s just so ill-mannered. Of course, now the guest of honor feels compelled to say “sure” and have me invite her, since otherwise it becomes a big deal. I’ll of course do what she wants, because it’s her party, but what type of friend would put their friend in such an awkward situation? It’s just so rude! I’ve had a great month. I took a very quick trip to visit a friend, and had a relaxing time. I’m enjoying the fall in NYC – I love the colors! I spent an hour or so wandering the City today, mostly in Central Park, and it was just lovely. The sun set, and it was that time of night before dark, where everything just kind of glows. The leaves are amazing right now. It’s chilly, but I have such a warm coat that I wasn’t even noticing it. Thanksgiving is coming up! Another orphan’s holiday over at Herman’s. Last year was so much fun – lots of mulled wine and yummy dishes. The first Thanksgiving I spent away from my folks was really hard, because (and this may seem silly) the food was all different! I’m sure that was just how I was channeling missing my family, but at the time it was all about the lack of Stove Top Stuffing (what, we are a simple people). Since I was probably 12 or 13 Thanksgiving was just me, my folks and my sister, and it was the same every year. Small, but with things we all love. But now I’ve gotten to the point where I think its fun to bring something I’m used to, and then sharing what other people bring. It really is a communal experience. And without the family drama! That was never actually issue with us (at least once it was just the four of us), but I know a lot of people stress about this because of all the other issues related to it. My folks will go spend it with their good friends, my sister will have I think a similar orphan’s day (or go to Houston to visit her friend). We’re also hoping to have a scaled-down Christmas. While I love getting gifts (it’s fun! ), there is very little I actually need. I think we’re each agreeing one gift per person. Plus stockings (I think). We can just have fun and enjoy the tree, and each other, and maybe convince my dad to play a few games. Goin’ to the Chapel . . .
. . . and watching other people get married! This was a wedding weekend. A friend I’ve known since I was five and in Brownies (Girl Scouts for the extremely pre-teen set, for those of you not in the know) got married this weekend. It was surreal. I’ve had three of my dear friends get married, but they were all people I’d met in college, so I’ve always known them as “adults”, and marriage wasn’t that odd an idea. But my fried Jen, well, we’ve been through it all. We went skiing together, we went to the beach together. She was visiting me in Tahoe the first time a boy kissed me (he was SOOO cute). When we were in 7th grade we did shots . . . of Sprite. We spent a few New Year’s eves together in college, when we were both home visiting family and didn’t really want to deal with parties. I believe I also helped get her to be able to go to a party when we were 18 where (shock and horror) there weren’t going to be any adults. And now she’s Mrs. Different Last Name. It’s SO WEIRD. I’m so excited for her. I don’t know the guy much better than I know most people I work with, since they live on the other side of the country, but she’s so happy with him, and he seems so happy with her. It’s just so cool and still SO WEIRD. The same day I went to Jen’s wedding, I got a message from ANOTHER friend, Reagan, saying she’s engaged. SWEET! I’ve got two friends engaged right now. Well, three. Kate and Richard are both my friends and engaged to each other. Reagan and Lon – I don’t know Lon all that well, but he seems like a great guy, and again, Reagan seems SO HAPPY. There is a documentary about many different types of families – step-families and interracial families – designed to educate young children. Evesham Township, New Jersey has stopped showing it, because one of the families shown is a gay couple who adopted children. I am completely closed minded on at least one thing. If I date someone who doesn’t think that gay people deserve the same rights as straight people, or think being gay is “evil” or a “sin”, the date is over. I can tolerate differing viewpoints on welfare, belief in god, taxation, stem cell research. But not gay rights. I’m an extremist when it comes to treating people equally. So this article really bothered me. Not because I don’t think that parents have a right to control what their children are exposed to (people will continue to teach their children racism, bigotry and misogyny outside of school), but because this decision means that they are controlling what OTHER PEOPLE’S CHILDREN are exposed to. Instead of allowing parents to opt out of letting their kids watch the video, the district banned the showing of the video. “That controversial”?! “Questionable”?! Really? How is this STILL controversial? I’ve yet to see an anti-gay argument that isn’t based in religion, so if it’s controversial because of someone’s religious beliefs . . . too bad. Your religion shouldn’t govern how another person’s child is taught. Ballymane? Ballymoney? Where am I going? Thursday started with a trip to the Bushmills distillery on the North Coast. I drove from Derry, leaving pretty early, so the coast was very foggy, and I figured what better way to pass the time waiting for the fog to burn off than by having 12-year-old whiskey at 11 in the morning? Plus, last time I was here I visited the Guinness Storehouse and the Jameson Distillery, so how could I miss Bushmills? I guess all that’s left is Bailey’s. I’m also surprised to find I rather liked the whiskey. Huh. Didn’t think I liked the really hard stuff, but after enjoying bourbon a few weeks ago and now this – maybe I’m growing up! 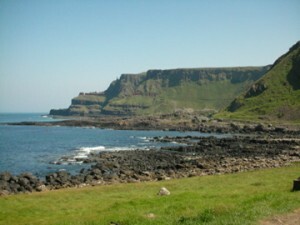 After that it was a very quick drive to Giant’s Causeway. Finn McCool (I think) is the giant that gives the geological site it’s name. Google him for the story. It’s kind of entertaining. Anyway, there are some gorgeous cliffs there, and great hiking, but the coolest are these huge stones that kind of remind me of those oyster cracker they give out with soup. Anyway, they are pretty big, and just not what one would expect to find. I spent about an hour just walking around, then went on to the Carrick-a-rede rope bridge. Basically, it’s this 30-meter-high bridge the local fishermen put up each March and take down in the fall to get out to this little island which is right in the salmon migration path. The water was amazingly clear – I really wanted to try to go in, but there wasn’t really a good way to get to the beach. It reminded me a bit like Vieques, or even Lake Tahoe on a really good day. I took loads of pictures, so you’ll get to see. I got back into Belfast around 4, returned the car, and relaxed. This morning, up early again to catch the train to Dublin, where I’ve been exploring for the past few hours. Vanessa is about to meet me, and then we head to a suburb where a party is being held for one of her friends. A perfect way to end a fabulous trip! Back in NYC by afternoon tomorrow . . . looking forward to my own bed. That Beyonce song has been in my head all morning, as I, for the first time, drove on the left side of the road, in a car with the steering wheel on the right side. I am still alive. Last night in Belfast I wandered the Botanic Gardens next to Queen’s university. They aren’t large, but they are lovely. There is a great lawn, where I sat for awhile to finish the book on the 1981 Hunger Strike. It was really peaceful until a few kids (well, teens) showed up to play, very loudly. I quickly left and discovered the rose garden, which again, was not overdone or huge, but simple and effective. I looped through it for a good 20 minutes, just looking at each different variety, and got some really great photos. There was a couple with three tiny terriers on the outside of the garden – every time I looped by, the dogs went NUTS and starting chasing me and barking. But they were the size of hamsters, so it was kind of hilarious. This morning I picked up my VW Golf and managed to get all the way from Belfast to Derry without getting lost, and without crashing. I even found the B&B where I’m staying, AND a parking spot in a non-limited zone without getting lost. It was marvelous. The B&B is really cute, and the bathrooms are en suite – a term I don’t hear often in the US, since I think in most places I’ve stayed every room has a bathroom. Anyway, it’s a nice surprise at a B&B to have my very own toilet and shower. The owner is nice and gave me a map and outlined places I should see, and even recommended places to get dinner tonight and listen to music. It’s a beautiful, sunny day (about 22 C, which is mid 70s F, I think), and I set right out to see Rossville Road, where the Bloody Sunday murders took place. By saying “murders” (and referring to Derry, and not Londonderry – lots of the signs here had the London part painted over), I’m identifying with the republicans. I went over to the road and visited the newly-opened Free Derry Civil Rights museum. I believe it is run by family members of the 13 who died on January 30, 1972, or at least I believe that now, as after I paid the fee, the gentleman told me about what I would be seeing, and ended by letting me know he is the brother of Michael Kelly, one of the 13 who was killed that day (he was only 17). That made it even more real. Throughout the museum are placards explaining the history of the Bogside, an area where the Catholics were forced to live, and the gerrymandering of districts that resulted in the loyalists being very over-represented in the government. The Civil Rights movement for Catholics here gained steam around the same time as the US Civil Right movement, and it was pretty violent. The museum had a great interactive section with audio and video, including images of protest posters, overhead film of the march that day, and songs written about it. Equally disturbing is the fact that they have the “soundtrack” playing throughout the museum. It’s a compilation of the sounds of that day – people screaming, gun shots, people yelling. It was really overwhelming. Also, my timing is interesting – the results of the new Bloody Sunday commission (the first one was a joke) are due soon, and there have been some controversial comments in the news about it. After that I was a bit drained, so I went out to see the murals in the area (I’ve taken so many pictures between here and Belfast of murals alone that I might have to do a separate book of just them). I then walked the city walls (it’s the last walled city in Ireland), got lunch at a cafe and finally stamped the last of the postcards (friends in Seattle and San Francisco – they are on their way!). I’m off to explore more of the city now. Tomorrow I’ll drive along the coast to Giant’s Causeway and the rope bridge (which I KNOW my dad would hate, given my memory of a similar bridge in Vancouver, Canada), then back down to Belfast. Friday I go back to Dublin to see Vanessa again, and we’re going out to a party that evening, which will be a great way to end the trip. I have had so much fun. I know it’s not over yet, but I am getting more reflective about this. Traveling alone these past couple of days has been interesting – I’m so glad I had Allegra and John and Richard and Vanessa the first ten days or so, but I’ve also enjoyed having time to myself. I think I’ll come back to NYC refreshed and ready to enjoy the summer. I’m not bummed it’s ending – I’m just so thankful that it happened at all! Belfast is lovely today. Coolish but not cold, and overcast but not raining. My hotel is great – kind of hip (with a large bar downstairs) but not over the top. And in a great location. Last night I wandered out to the university section for dinner. This morning up a bit later than normal (8 am), and then off to explore. At Paula’s suggestion, I visited the linen hall library. They have a huge section devoted to northern Ireland political history. I found it appropriate to spend some time there reading my book “Ten Men Dead”, about the 1981 hunger strike. Paula, if you’re reading this, I also tried to visit Ruby Tuesday’s, but alas it has been replaced by another restaurant. After that it was off to City Hall for a tour – we happened to be there when the Mayor-elect was coming in, so he said a quick hello to us. He was just elected mayor last night. He’s the first Lord Mayor to be elected to a second term since they instituted the new rules. The Lord Mayor is elected by the councilors, who are elected by the people, and they serve just one year as Lord Mayor (4 years as councilors), and cannot run in consecutive terms. The building itself is really ornate and gorgeous – it was damaged severely during the blitz in WWII, but only the great hall (the dome was unscathed). It’s a really cool building. I then caught the bus tour around town – I did that last time, but this time I knew a bit more about what I was seeing, AND it made the trip out to Stormont, the Northern Ireland parliament building. That’s been in the news as of late – it was shut for a few years, but now a power sharing agreement has been reached, so I believe it will reopen soon. It’s also a good way to see the Falls Road and Shankhill road areas, which have the famous murals and the massive peace wall. Late this afternoon I did my part to help the Belfast economy. Now it’s back to the hotel for a rest before I venture out to explore the botanic gardens in the evening. Tomorrow, on to Derry, where I will make my first attempt at driving on the left side of the road. Wish me luck!